Sometimes in Windows XP when you update a device driver, the new driver version doesn’t necessarily get along with the XP configuration. If you update your system’s hardware and suddenly things don’t seem to work correctly, one troubleshooting step is to rollback the current driver to the previous one. In my IT career I have noticed this the most with Video and Print drivers. Of course any hardware can fail due to an incorrect software driver. Right click My computer Properties hardware and go into Device Manager. 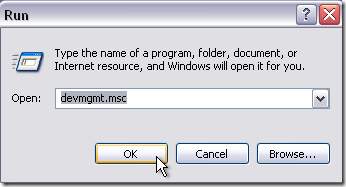 Or a much easier way to access Device manager is to enter “devmgmt.msc” into the run line then click OK. In device manager just navigate to the device which is not behaving correctly. For this example I will use the Integrated Sound Device. Right click the device and select Properties. Now click the Driver tab then the Roll Back Driver button. 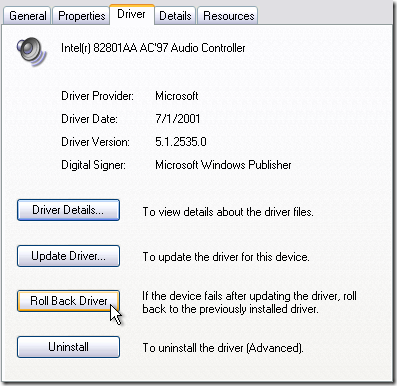 Agree to the warning box to continue rolling back the driver to its previous state. 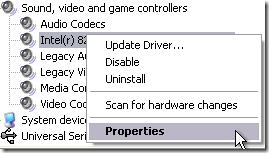 This is a much easier step than doing a complete System Restore.